Hosted by Kupuri Beach Club, this true celebration of summer is set for August 4-5, 2018, so get ready to enjoy life, play, eat, drink and dance under sunny skies at the 6th Annual Punta Mita Beach Festival. Riviera Nayarit, Mexico - The sixth annual Punta Mita Beach Festival, a family-friendly event that brings together the best beach activities with all the natural beauty and adventure that the Riviera Nayarit has to offer, is set to take place this weekend. Hosted by Kupuri Beach Club, this true celebration of summer is set for August 4-5, 2018, so get ready to enjoy life, play, eat, drink and dance under the sunny skies of Punta Mita and, of course, continue the celebration with fabulous parties under the stars. The 2018 Punta Mita Beach Festival will showcase the and signature dining options and extensive recreational experiences available to Kupuri Beach Club residents and guests through the Ocean Sports program. 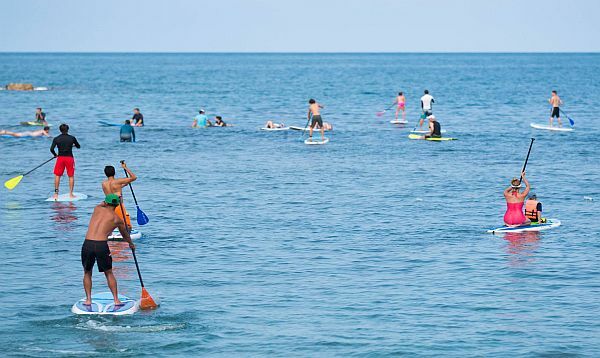 The schedule offers one-of-a-kind, exciting family opportunities like underwater treasure hunting and inflatable beach soccer, and a range of diverse water sports and wellness events including yoga, windsurfing, paddle boarding, derby races and more. You'll also enjoy Gourmet Beach Experiences with exceptional food and drinks prepared by renowned local chefs, like Pato Pérsico, the Executive Chef of Punta Mita Beach Clubs; Hugo Ahumada, the Chef Ejecutivo at La Patrona Polo Club; and Israel Díaz Pelayo, the Riviera Nayarit's Mixology Ambassador, complemented by the sounds and rhythms of Kupuri Beach Club's resident DJ. For more information and the full schedule of events, visit livepuntamita.com.